The Julian Price Showhouse in Greensboro just wrapped up its last public viewing days, and boooy was it a beauty. Below is the gorgeous guest bedroom that my amazing bosses Laura and Gina at Vivid Interiors designed with the help of my coworker Natalie. This project actually summarizes pretty well what the creative strategist role means at a business like Vivid. It's a lot of the behind-the-scenes details that don't necessarily involve the actual design of a space. After my bosses took care of the expert interior details: selecting window treatments, furniture, wall coverings, light fixtures, etc, I helped create the watercolor rendering of our proposed space, sketched up and painted the bathroom painting, and when each floral arrangement's leaf was finally nudged just so, photographed our room alongside fellow photo nerd Evan Brearey. Below are some of mine from our shoot day. 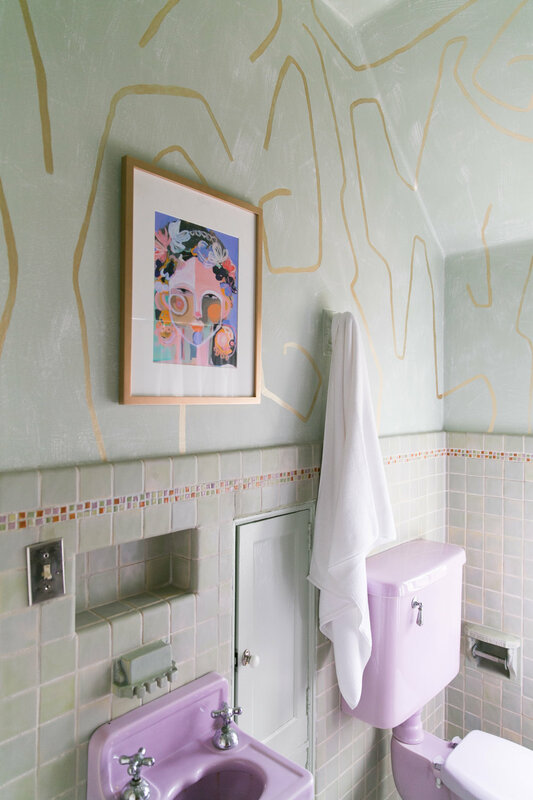 For the bathroom, we'd initially had it painted this muted green to match the tile, but Laura and Gina thought a bold Kelly Wearstler-inspired pattern would match the funky vibes we were aiming for. With a half-inch paintbrush in hand, several large cups of coffee and a couple days on a ladder, I got these gold guys up on the wall(s). It took longer than I expected, but coating each of these lines thick enough to ensure a rich metallic sheen proved worthwhile.